Excellent location with friendly and professional staff. Royal Ontario Museum, Bloor Street shopping, Gardiner Museum (ceramics). CN Tower, Toronto Aquarium, Rogers Place, City Hall, OAG, ROM, Gardner Museum, live theater. Gardiner Museum is located in a vibrant area of University District known for its popular theater scene and top museums. The neighborhood is home to 702 hotels and other accommodations, so you can find something that works for your stay. The Anndore House: With a stay at this 4-star hotel, guests can enjoy access to a restaurant and a bar, along with free WiFi. Our customers like its central location and clean rooms. While you're in town visiting Gardiner Museum, you can explore the sights within just a few miles of the area. Royal Ontario Museum, Casa Loma, and Hockey Hall of Fame feature a variety of fascinating exhibits to see while you're in town. While you're exploring, swing by Nathan Phillips Square, Harbourfront Centre, and The Distillery Historic District to learn a bit about the area. You can watch performances at Ed Mirvish Theatre, Elgin and Winter Garden Theatres, and TIFF Bell Lightbox if you're interested in local theater. If you want to see more of the surrounding area, you can plan a visit to University of Toronto - St. George Campus and Ryerson University. Yonge-Dundas Square is also located 1 mi (1.6 km) from Gardiner Museum, and Toronto Eaton Centre is 1.1 mi (1.8 km) away. With so many choices for transportation, seeing all of the area near Gardiner Museum is easy. 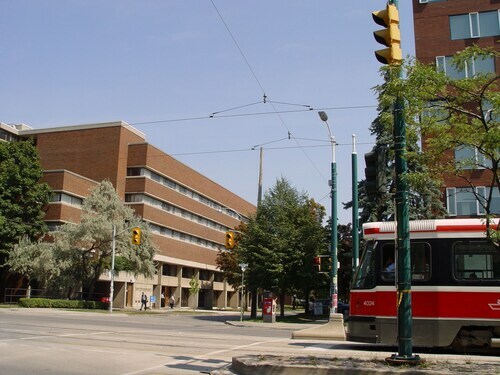 You can walk to nearby metro stations including Osgoode Station, St Patrick Station, and St Andrew Station. If you're taking a train into town, Toronto Union Station and Toronto Exhibition Station are the closest stations to Downtown Toronto.